We often use six iShares exchange traded funds (ETFs) to represent the six movements of the asset categories. While these products are not the indexes themselves, you can’t invest in an index. Because these are relatively low cost products that you could have been invested in, they represent investor experience well. 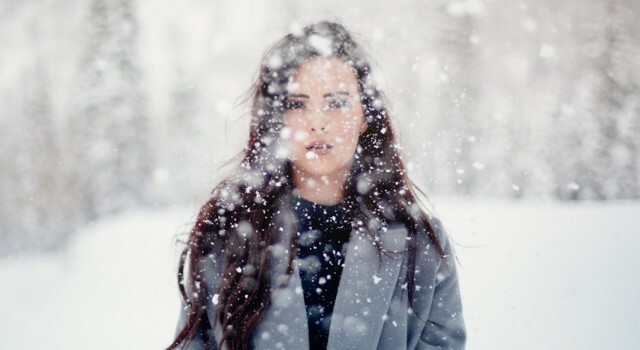 In this article I will be quoting both the The S&P 500 Price index, which does not include dividend payments, as well as showing the return of iShares Core S&P 500 ETF (IVV), an exchange traded fund attempting to track the S&P 500 Index whose return includes dividends but out of which is taken a modest 0.04% annual expense ratio. The S&P 500 Price Index reached its most recent all-time high on September 20, 2018. Then, it mostly dropped during the fourth quarter of 2018. 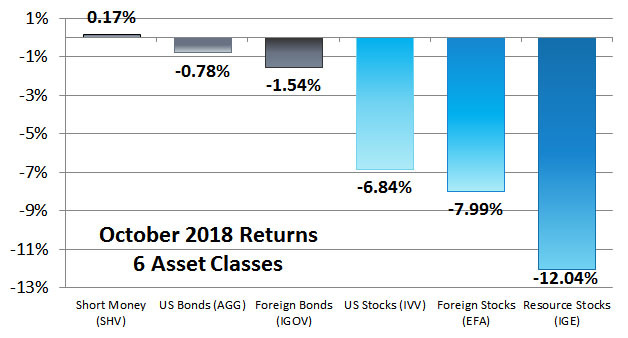 In November, 2018 the S&P Price indexed rallied slightly appreciating 1.79% (IVV 2.03%). Meanwhile, resource stocks continued to slide. The S&P 500 Price Index continued downward in December, 2018 bottoming on Christmas Eve, down -19.78% from its prior all time high. This was just shy of the definition of a Bear Market. Then, in the closing days of 2018, the market rallied 6.62%. 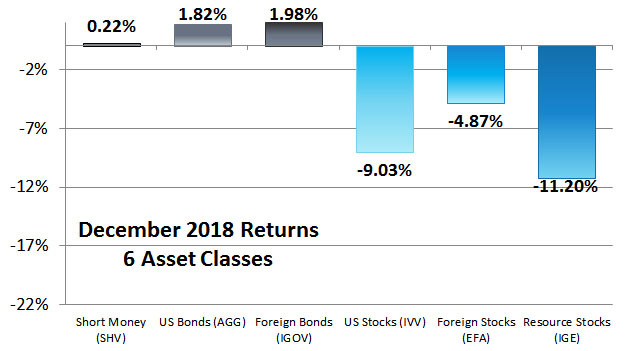 At the end of all of that movement, the S&P 500 Price index dropped -9.18% (IVV -9.03%) in December 2018. 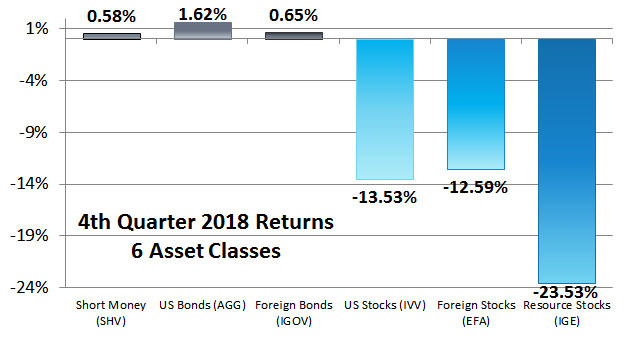 These three months were poor returns, but not anywhere out of the ordinary. 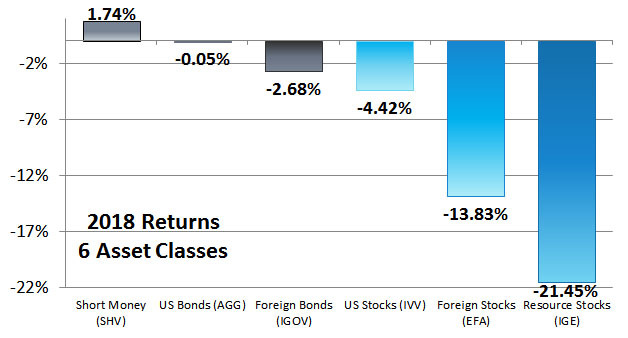 On average the markets move about ±10.55% during a 3 month period. These market returns panicked some investors. However, those emotions are unhelpful. Long term investing erases all this short term volatility. It is always a good time to have a balanced portfolio. 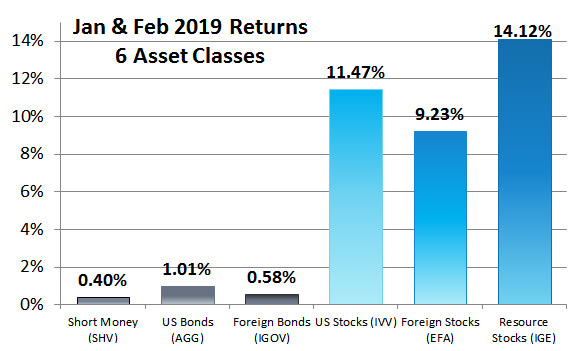 Already as of the end of February 2019, the S&P 500 Price Index is up 18.43% since the Christmas Eve low and 11.08% (IVV 11.47%) year to date. 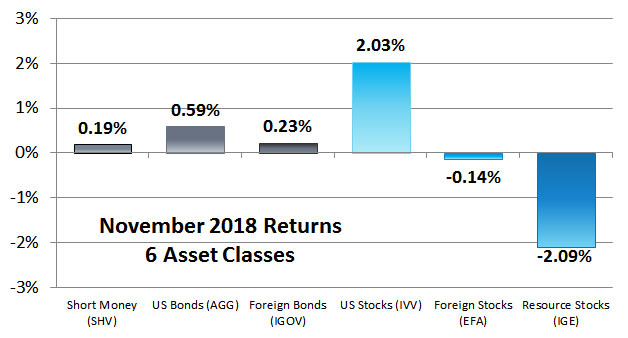 So, what should you do in response to 2018 year-end returns? Simply rebalance. Don’t let your fear of the future ruin your future. It is always a good time to have a balanced portfolio.